The centre was originally started to offer adventurous training to British service personnel nearly 40 years ago. This same offer continues today but as a result of continued interest, a club was formed to allow participation and progression in the sport. 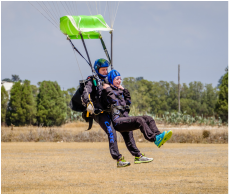 The Cyprus Parachute Centre welcomes all-comers and can offer a variety of ways to experience this exciting sport. Please refer to the 'Course information' page and then contact the centre to make your interest known.